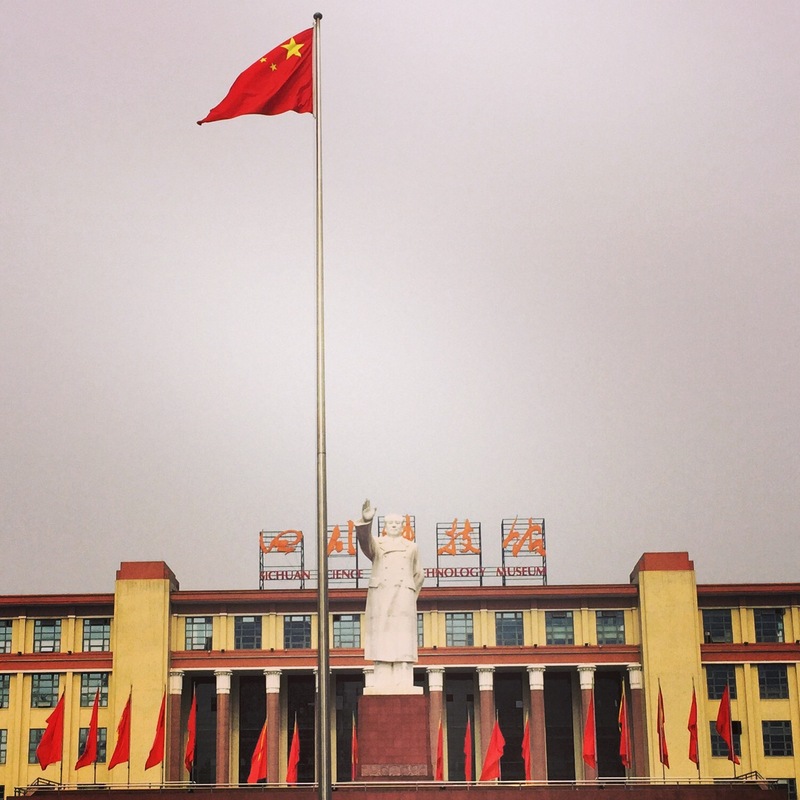 A statue of Chairman Mao Zedong looks over Tianfu Square, in the center of Chengdu. Chendgu is the provincial capital of Sichuan province, which is known throughout the world for its spicy food. 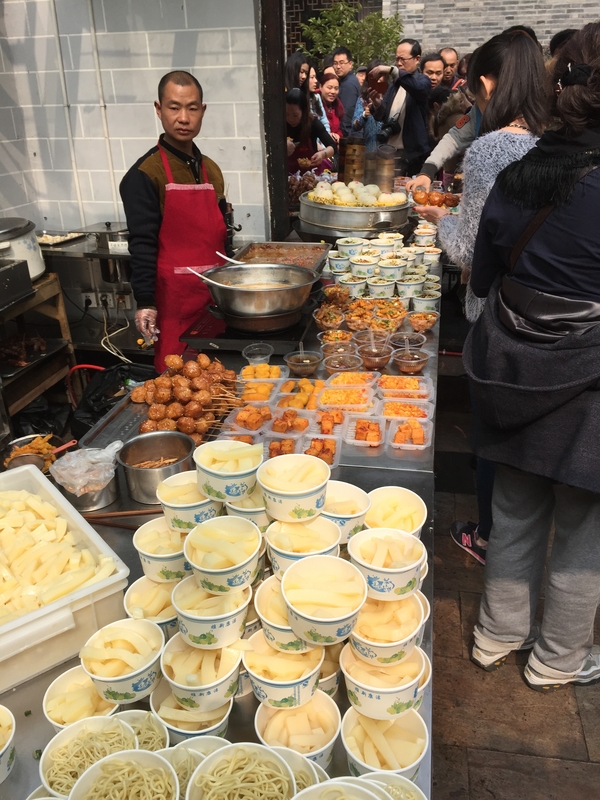 A vendor sells snacks at a restaurant on Jinli Pedestrian Street, a popular tourist area. 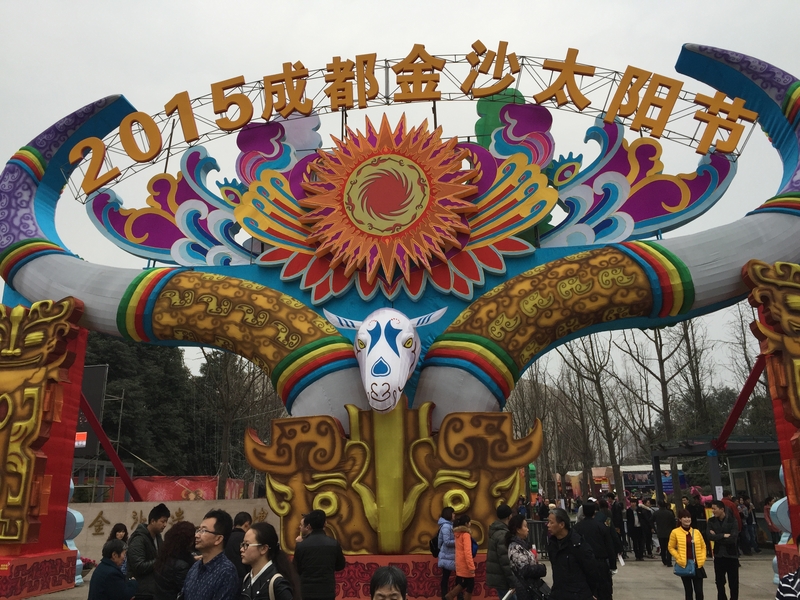 The entrance to a temple fair, held to celebrate Chinese New Year. 2015 is the Year of the Sheep. 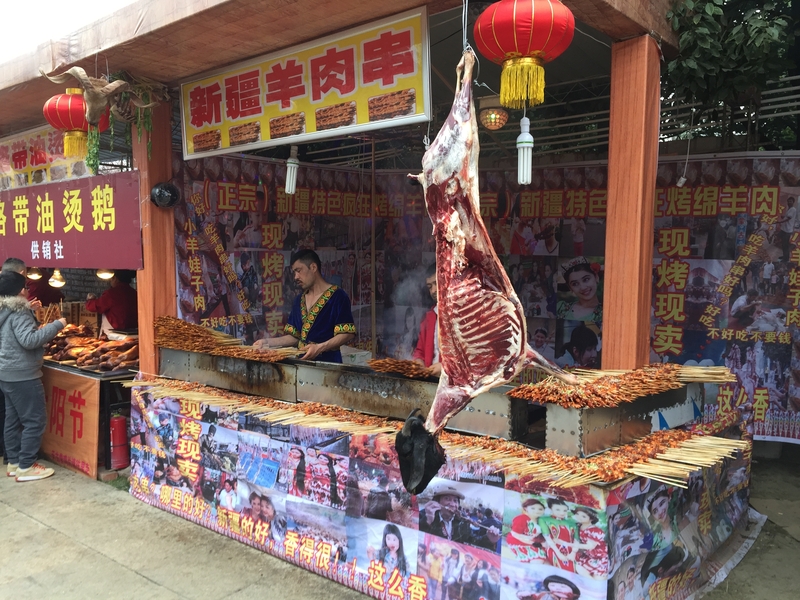 Vendors from western China’s Xinjiang Uyghur Autonomous Region sell lamb skewers at the temple fair. 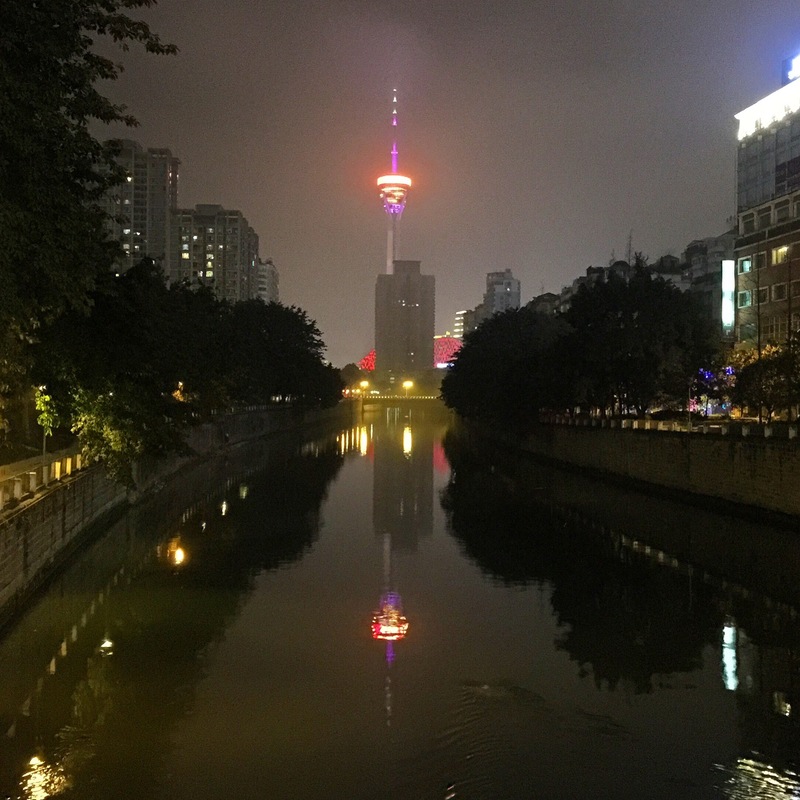 With 14 million people, Chengdu is the largest city in Sichuan province. The panda is the national animal of China, and there’s no shortage of shops in Chengdu selling stuffed toys, T-shirts and coffee mugs featuring the animal. If Budweiser is the King of Beers, then Hello Kitty is definitely the Queen of Beers. Available in six tropical flavors — including passion fruit, lemon lime and banana – Hello Kitty Beer is sure to sap whatever manliness you possess with just one sip. The beer was introduced in Taiwan and is now available on the Chinese mainland. Over the weekend, I hiked to the top of a mountain at Fragrant Hills Park, an imperial garden in northwest Beijing. The park is well-known for its Smoke Tree leaves, which turn red in late autumn, attracting thousands of tourists. I reached the peak – 557 meters above ground – in an hour and a half, and after I climbed the final set of stairs I turned around to take in a view of the city. Just as I pulled out my cellphone to take a picture, an old man using a walking stick passed me. 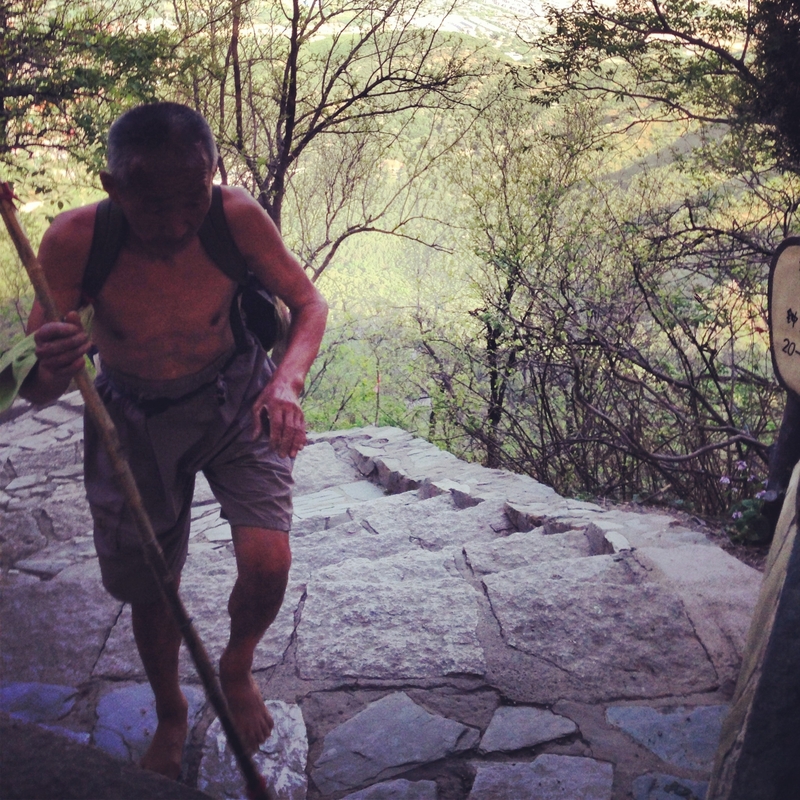 He was hiking barefoot and shirtless, and moving at a brisk pace. He must have been at least 60 and was fit too, especially for his age. I wouldn’t want to challenge this guy to a race. If you ever visit the Great Wall, go wild. As in wild, unrestored sections of the wall. They’re a lot less likely to be crowded and reaching them can be an adventure in itself. Last May, a friend and I hired a driver to take us from downtown Beijing to Jiankou, a section of the wall on the outskirts of Beijing built in the 1300s. Finding a flower shop had never been so hard. Then again, this was the first time I’d tried to do it on an island in China. It was Valentine’s Day, which unfortunately also happens to be my girlfriend’s birthday. I say unfortunate because the stakes are twice as high. Choose a lame gift or a less-than-spectacular restaurant and the consequences are exponentially bad. I really tried to be a “Belieber.” Not that I was ever into your music or dance moves (OK, I downloaded “Baby” – albeit, illegally – but only because it’s upbeat, and I’m running out of songs to jog to). One of the things I miss most about living in a small town is the space: the ability to stretch out my arms without hitting another person or walk for miles without seeing anyone. It’s a luxury you lose in a city like Beijing, where even the widest streets sometimes feel every bit as cramped as the smallest alleys. The crowds are difficult to avoid, whether you’re riding the subway in the middle of the day or going to the bank on a Saturday. The feeling of constantly cramming into lines and bumping elbows with strangers can become overwhelming. When I need a break from the crowds, I often head into one of Beijing’s 300 parks. 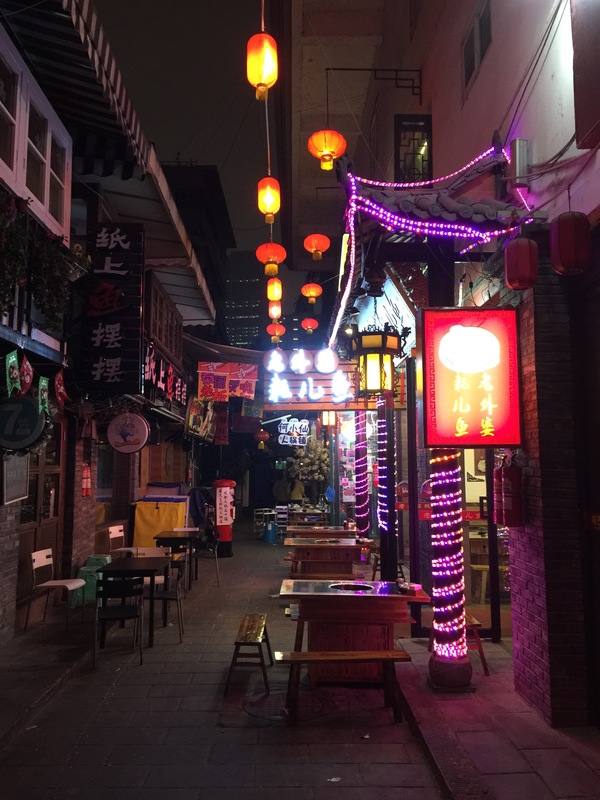 For a city hell-bent on growth and economic development, Beijing has a surprising amount of space committed to leisure and recreation. The largest is Chaoyang Park. At 713 acres, it is is comparable in size to New York’s Central Park. 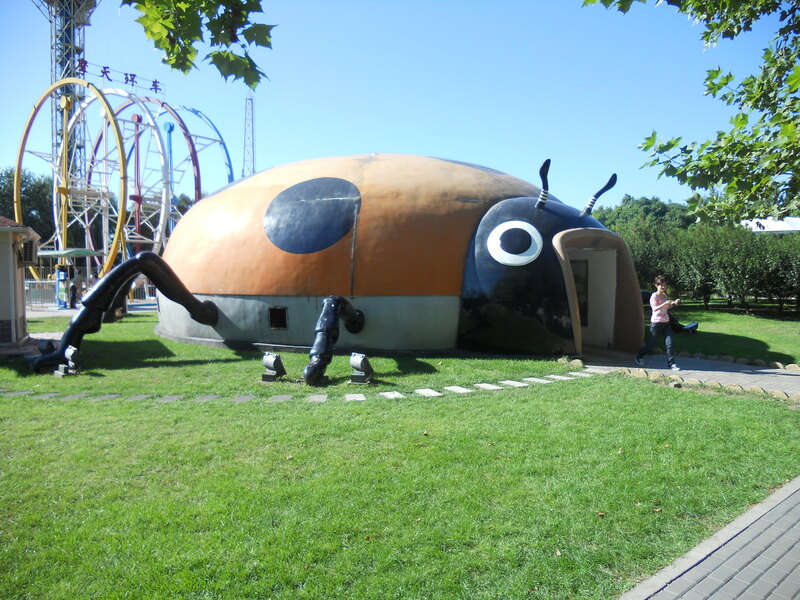 It’s home to a very unsafe-looking roller coaster (the only thing holding the safety harness down was a seat belt that looked like it had been pulled from a junked car), volleyball courts that were used during the 2008 Olympic games and restrooms that resemble a giant ladybug.